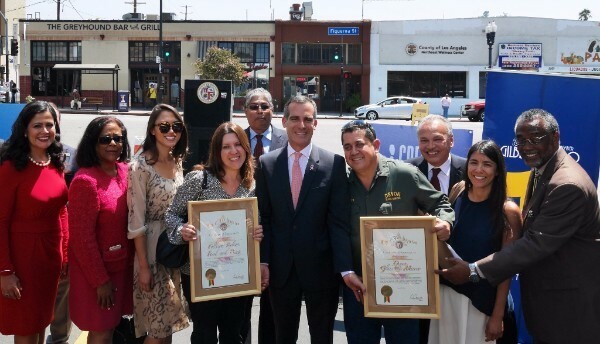 Today Los Angeles Mayor Eric Garcetti announced the launch of the Great Streets Great Business program. This new program provides resources to all small businesses that are currently located on a designated Great Street corridor. The Great Streets Great Business program is administered by the Valley Economic Development Center, a small business expert serving Los Angeles for over 40 years. Access to Capital: Loans from $1,000 up to $250,000 for working capital, real estate acquisition, building improvements, tenant improvements, construction and more. Business Retention: Technical assistance on marketing, accounting, and business plans to existing businesses through local Business Source Centers. Business Attraction: Recruitment of additional neighborhood-serving small businesses to Great Streets with high commercial vacancies. 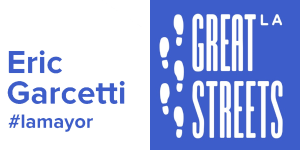 The Great Streets Great Business program joins other resources available through the Great Streets initiative including, the Great Streets Challenge, Arts Activation Fund, enhanced street maintenance and streetscape projects. Check out LAGreatStreets.org for more information. A new loan program led by Mayor Eric Garcetti’s Great Streets initiative aims to give small business owners the boost they need to open their doors, grow their companies, and create good-paying jobs. Great Streets Great Business is a $4 million business assistance partnership between Mayor Garcetti’s Great Streets initiative and the Valley Economic Development Center (VEDC), a local non-profit financial institution. Mayor Garcetti launched the new program today alongside L.A. City Councilmember Curren Price. Great Streets Great Business will support small businesses located along L.A.’s first 15 Great Streets corridors by providing easier access to capital than a standard business loan. It will also provide resources like site selection and lease negotiation assistance that give businesses the chance to put down roots and thrive in their communities. The loan program will prioritize community businesses, and offer loans of $1,000-$250,000 to qualifying applicants. "As a former entrepreneur, I have a deep and very personal passion for serving small businesses in the Ninth District," said Councilman Curren D. Price, Jr., who chairs the City Council’s Economic Development Committee. "One of the first initiatives I spearheaded coming into office in 2013 was to form a Business Resource Center because I understand the importance of having access to business development tools. I'm honored to lend my support to Mayor Garcetti's Great Streets Great Business program because it helps promote the growth of local, small and emerging businesses citywide. Entrepreneurs need capital, services and training and this initiative offers just that." Great Streets Great Business is just the latest of Mayor Garcetti’s efforts to support small businesses across Los Angeles. Last year, he announced a $250,000 grant from the Small Business Administration to help fund the development of online tools that will help get small businesses off the ground faster and more efficiently. Mayor Garcetti also launched a Small Business Academy that provides guidance to small business owners learning how to bid successfully for City contracts. Great Streets Great Business is a close collaborative effort between Great Streets and VEDC. VEDC will work with L.A.’s BusinessSource centers to coordinate free workshops and one-on-one consultations, and provide assistance with site selection and lease negotiation. They will also contribute by providing business loan underwriting, and canvassing all 1,400 businesses on the first 15 Great Streets corridors to offer needs assessments and technical assistance to businesses. In addition to VEDC, Great Streets Great Business is made possible by the Los Angeles Economic and Workforce Development Department and the Mayor’s Fund for Los Angeles, with support from AT&T.